Cake Mix Donuts and NEW Simply Juice Drinks! Breakfasts at our house usually go one of two ways. It’s either a quick and easy breakfast, or it’s a slow will it ever be done so we can eat kinda breakfast. We find that on weekdays where school is impending, it’s the former. It becomes a treat when we get to sit down together for a nice breakfast. We’re working on this, I promise. I don’t ever want life to get so busy that we miss out on each other’s company. 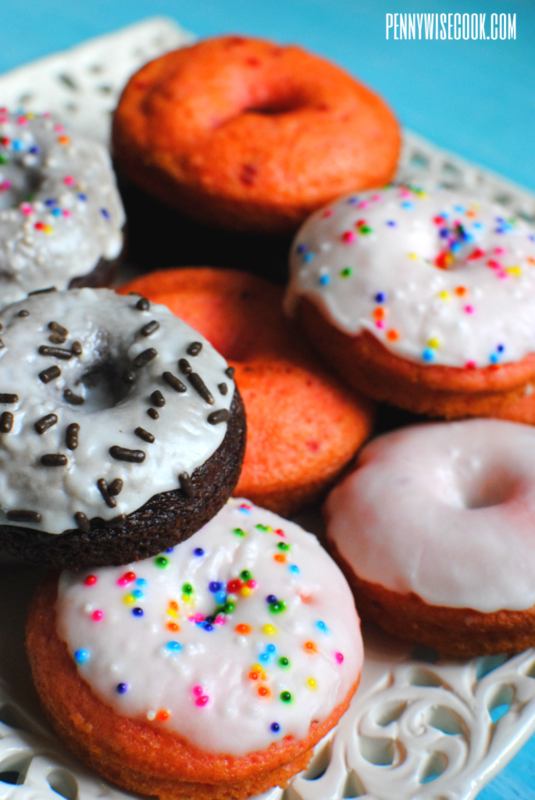 I’ve been known to make homemade donuts for breakfast. No complaints from the girls. Or the husband for that matter. These Baked Lemon Berry Donuts were amazing. 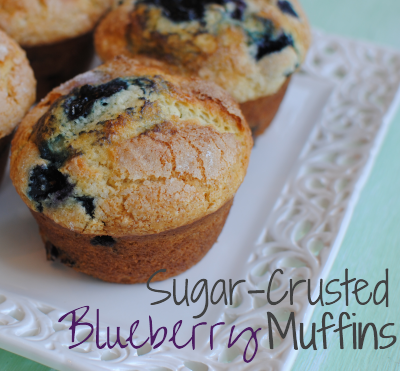 I’ve also made a blueberry version of these that was so tasty. The other day I wanted to make some homemade donuts for breakfast, but I didn’t have all of the ingredients. 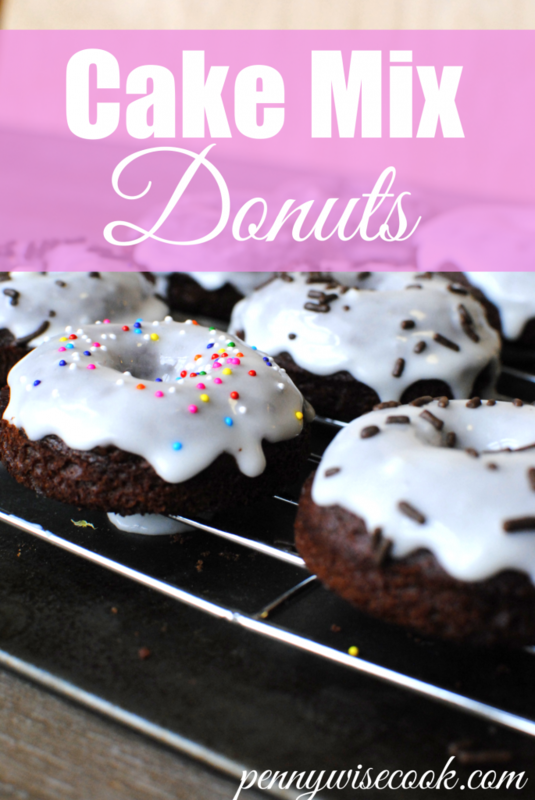 Of course, I consulted Pinterest and came across a recipe for CAKE MIX donuts. I thought to myself, does it really get any easier than that? Decision made. Donuts created. 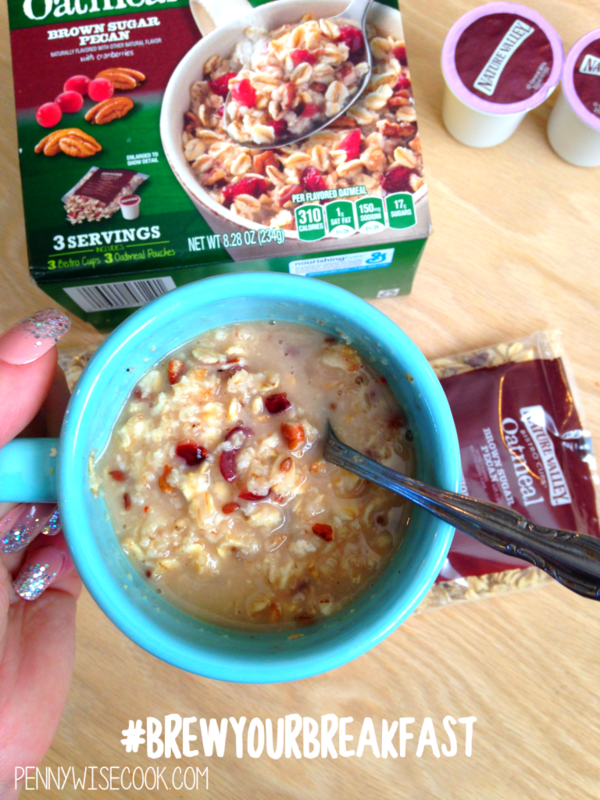 One of the easiest breakfasts ever. I can feel better about these being made of cake because they aren’t fried like most donuts, right? I can also feel better about them because they take about 5 minutes to make, right? Of course! 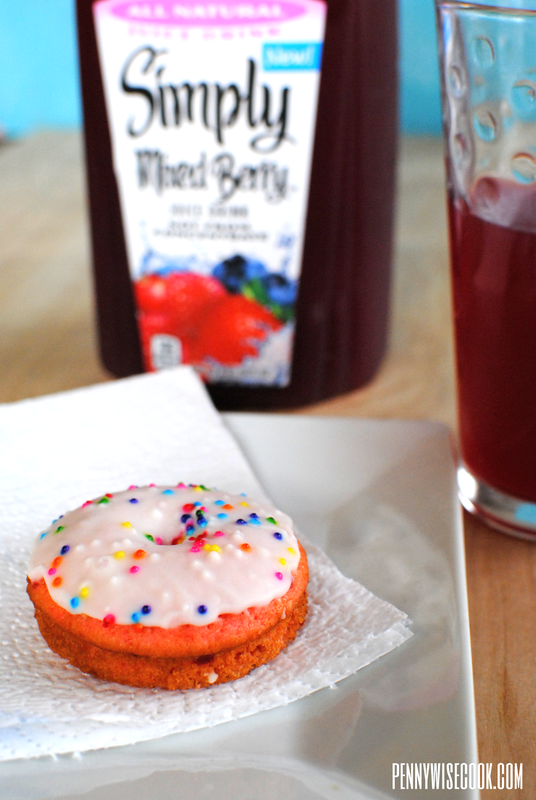 You know something that goes great with donuts? One of my favorite brands, Simply Beverages, has come out with a new premium line of juice drinks that are so incredibly tasty y’all. Our family has always been a fan of this brand. It is high quality! All of which are ALL NATURAL (not from concentrate yay), made with simple ingredients, and contain no preservatives. They all taste so pure and incredibly natural. I’m not just saying that either. You can always tell when a juice has a bunch of stuff added. This juice drink tastes like they just squeezed the living daylights out of the fruit and boom, juice! 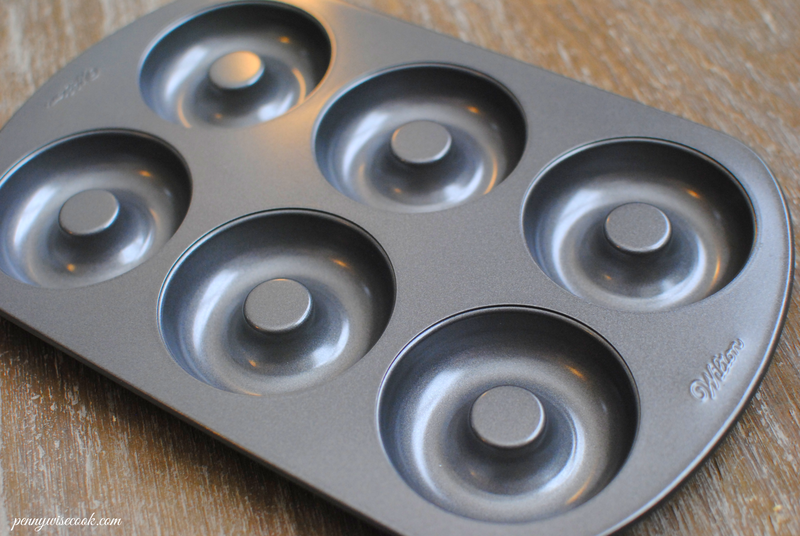 To make the donuts, you’re going to need a donut pan. You can grab this Wilton Nonstick 6-Cavity Donut Pan for only $9.99 at Amazon. I have a large and a small version of this pan. The mini donuts are plenty big. Though I sometimes still find myself eating more than one! The ingredients for these are so simple. I want to eventually play with the consistency of the donuts. They are still a little light like cake, so I’m going to work on tweaking them to get a bit more thick. I had a bit of a hard time deciding if I liked the Tropical or Mixed Berry the best. I love pineapple so I really enjoyed this one. SO good. It goes well with whatever I choose for breakfast. Like for instance, this here donut. 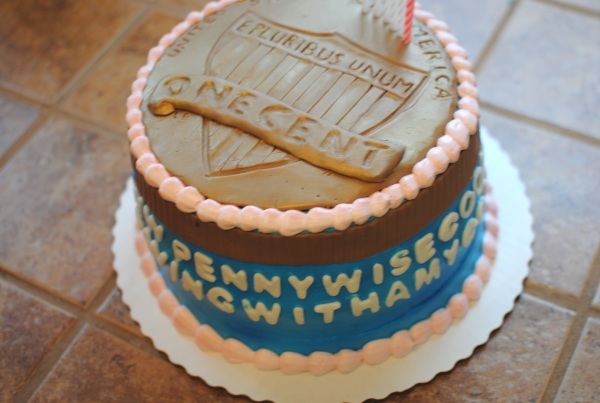 Yeah, it’s made of CAKE! Simply Juice Drink Mixed Berry I think has made its way to the top as my fave. I’m a little fruity sometimes. 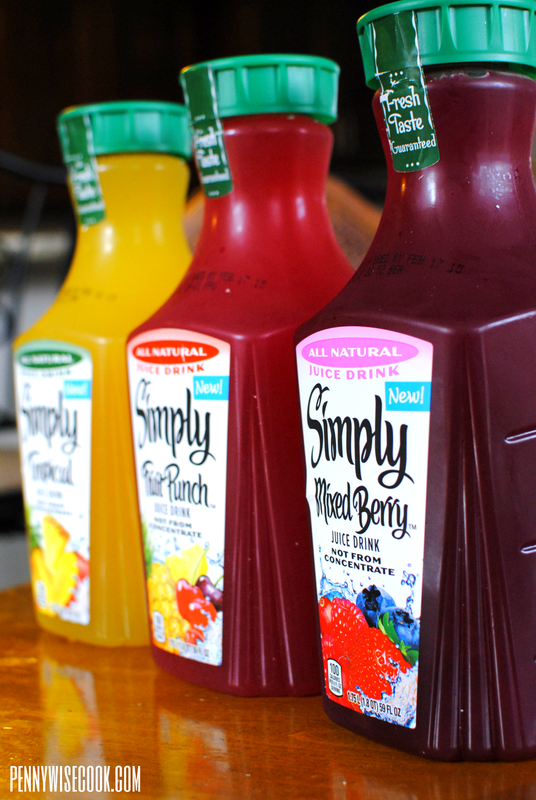 You can find all of these Simply Juice Drinks in the refrigerated at your local grocery store. They come in the big 59 oz bottles (in all 3 flavors) or convenient 11.5 oz single serve bottles. 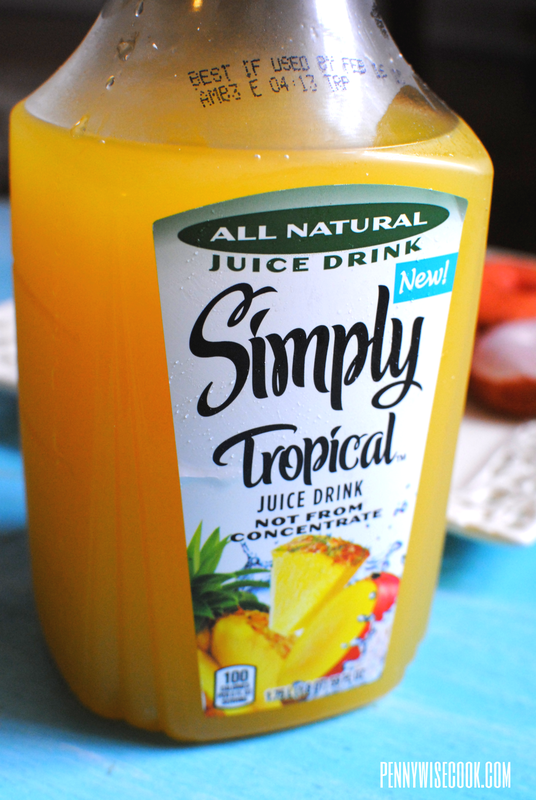 Be sure to visit Simply Orange Juice on Facebook to keep up with the latest on all Simply Beverage products. Simply Beverages has provided an outstanding GIVEAWAY for you guys! Be sure to enter the giveaway below the recipe. Spoon or pipe batter into greased donut pan wells. 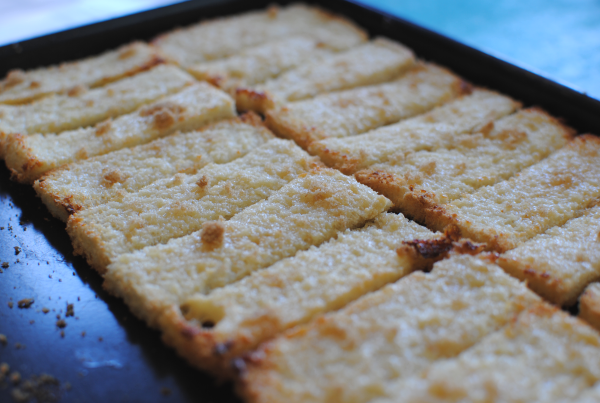 Bake for 10-12 minutes or until edges begin to brown. Let cool and use a fork to remove and place onto cooling rack. Carefully! Combine all ingredients and mix until spoon. 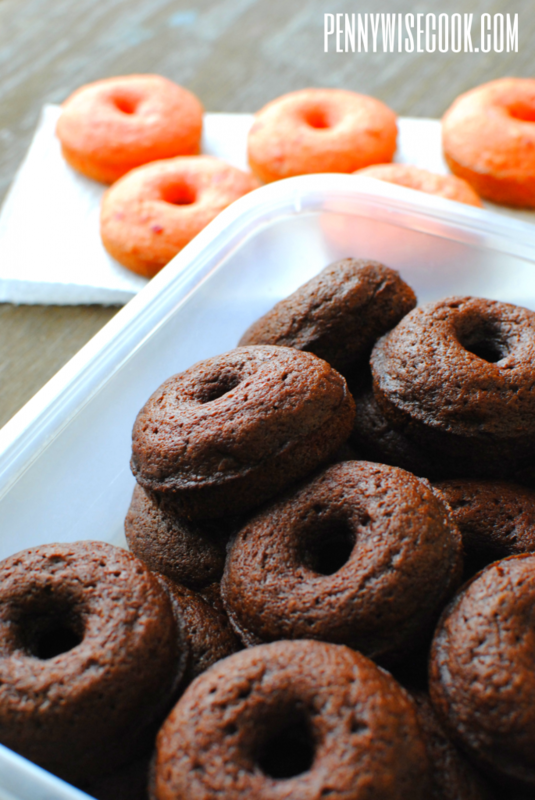 Dip donuts into glaze and place on wax paper or cooling rack to dry. Add sprinkles or toppings you desire while wet! 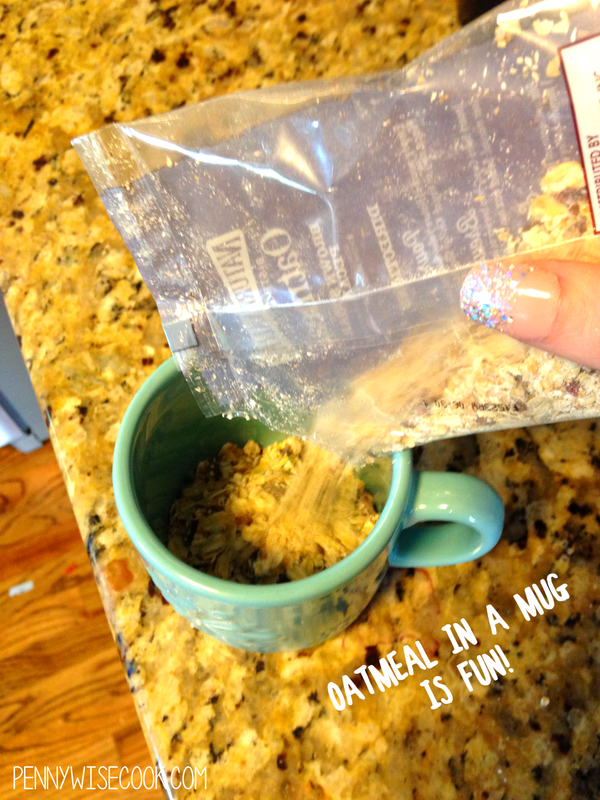 You can add less milk to make it thicker or more to thin it. This giveaway will end on January 2nd at 12:00am CT. I will contact the winner on January 3rd and they will have 24 hours to respond. If I have not heard from them, I will name a new winner.I was provided with the Simply Beverages for review purposes and compensated for my time. All opinions expressed are 100% my own. This prize was provided by Simply Beverages, but Simply Beverages is not an administrator or connected in any other way with this contest [or sweepstakes, or giveaway as applicable]. It is MAY! Where in the wide world of sports did March and April get off to? I remember thinking wow, it’s already March and then BOOM it’s May. I’m mostly caught off-guard because both of my girl’s birthdays are in May which means that mommy has a lot of work to do. My oldest’s birthday is next week and I decided not to procrastinate this year by asking her cake preference a week before instead of, oh, the night before. These are Mom Of The Year qualities, you know. She chose My Little Pony with a Rainbow Dash emphasis. For those of you who don’t know about these girly things, just know that I have a lot on my plate next week. There’s probably a chance that you’d like to know about those big, fluffy waffles up there. I could tell you many stories about when my mom used to make these for me. Without exaggerating, I probably ate 4 of these in one sitting when I was younger. I could do the same now, but I try to practice self-control. My mom always made them from a box. Do not get me wrong, that is normally the very method that I would use. However, since I do have a tendency to eat a redonkulous amount of them, I wanted to make sure and healthify them up just a bit. 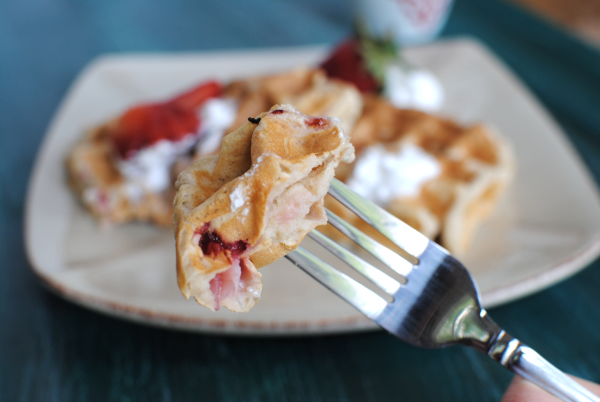 These Homemade Strawberry Belgian Waffles contain no butter, oil, or eggs. You could use soy milk or almond milk in place of the milk and you’d have them dairy free! They aren’t artificially made to taste like strawberries like some boxed mixes might work. 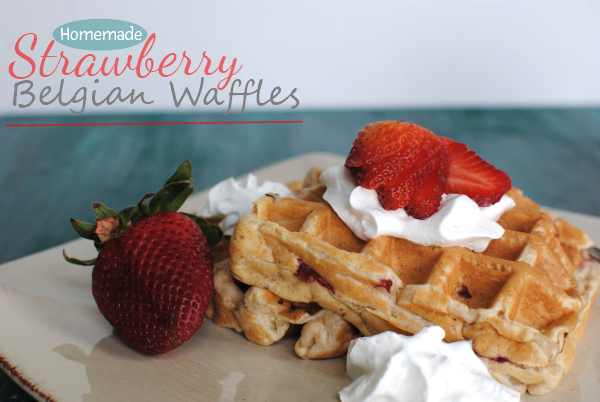 They are literally made with fresh strawberries which give them a more natural flavor. I almost called these Strawberry-Banana Belgian Waffles because I used bananas instead of the oil/butter/egg, but the banana taste didn’t come through as much as I was expecting. Even the strawberry taste didn’t become as potent as I would have liked. 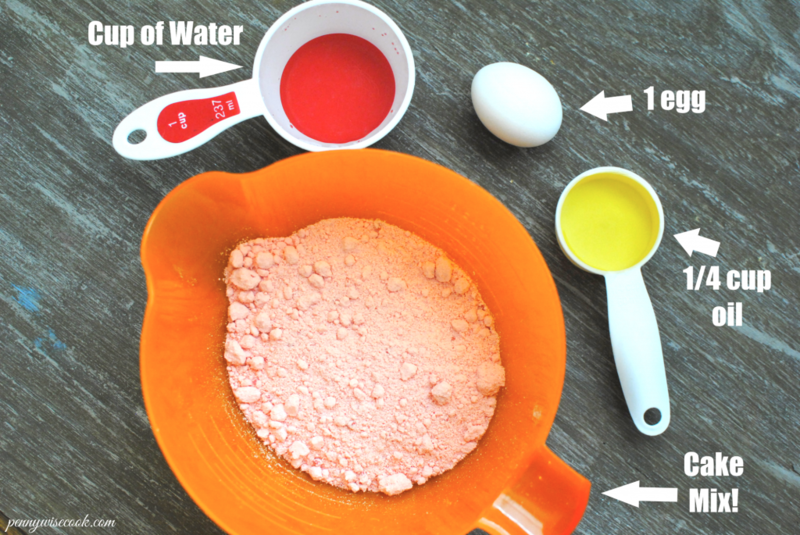 But if you’re brave and don’t mind a little sugar, you can add a tsp of sugar to the strawberries before adding them to the batter and I’m sure that it will bring out the strawberry flavor a little more. I think my favorite part about Belgian waffles as opposed to regular waffles is the fact that they are super fluffy. My waffle iron makes 2 of these at a time. With the amount of batter that I mixed up, I got 4 total. To help you know how many of these you’ll get out of 1 batch. I’d recommend doubling the recipe if you have a hungry bunch. Believe me, they won’t eat just one. Recipe adapted from Vegan Heartland. 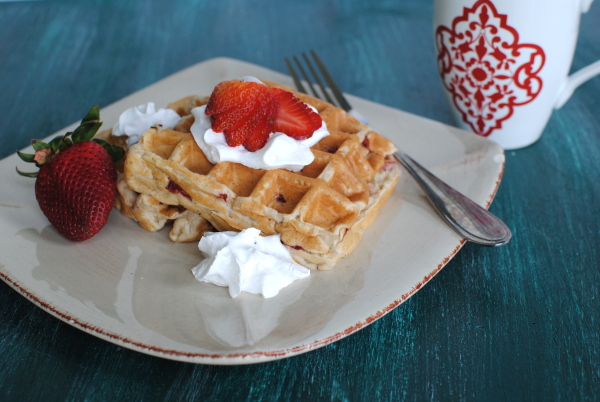 Strawberries add a summery flavor to sweet and tasty belgian waffles! You’d never know these were healthy. 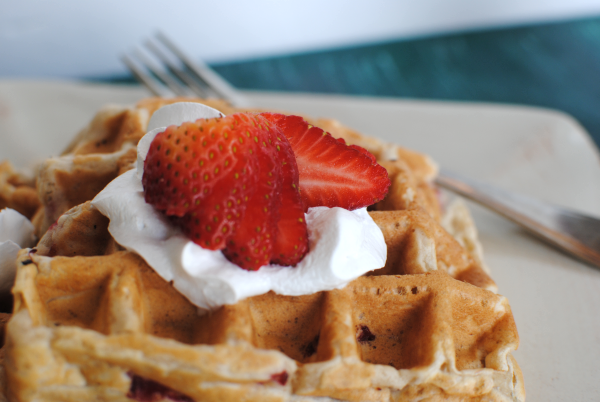 There are only about 150 calories per waffle! In a small bowl, stir together flour, salt, and baking powder until combined. Set aside. In a separate mixing bowl, combine maple syrup, banana, milk, and vanilla. Mix on low until fluffy. Slowly add the dry ingredients to the wet and mix well. Then gently fold in the strawberries. Cook according to your waffle iron’s directions. Optional) Top with fresh strawberries and Reddi Whip! – If you wanted to bump up the nutrition, you could also add some flax to these. I used about a 1/4 c whole wheat flour in mine. – You can use pretty much any type of milk in place of the dairy milk if you’d like. Even coconut milk. It’s just a matter of your preference! Facts (per waffle not including toppings): 147 calories, 40 carbs, 0 grams fat, 5 grams protein, 417 gram sodium, 3 grams sugar. My mission lately is to make sure that I eat all 3 meals. I have a tendency to get busy with the girls, cleaning the house, or perhaps blogging my favorite recipes with you and just completely lose track of time and meals. 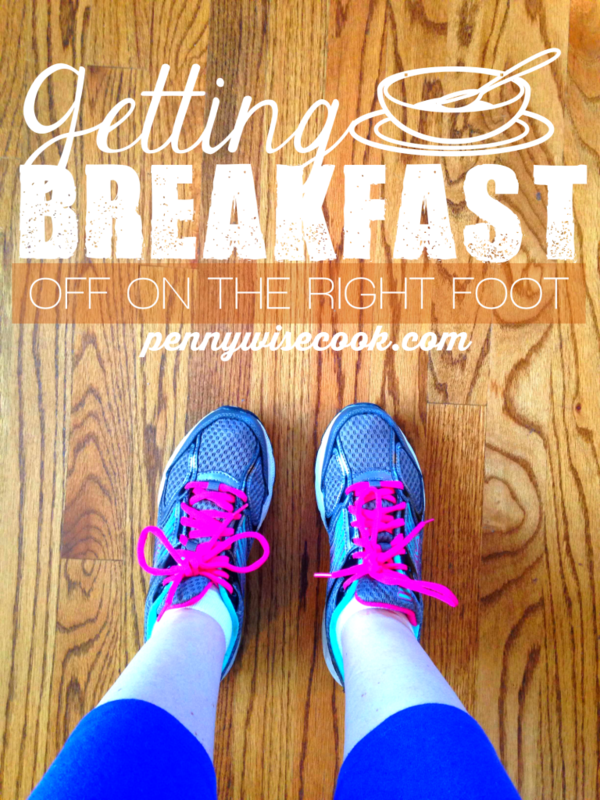 That’s coming to an end because I’m on a mission to find filling, yet easy breakfasts and lunches. I’ve been making one that I wanted to share since I find it really tasty. 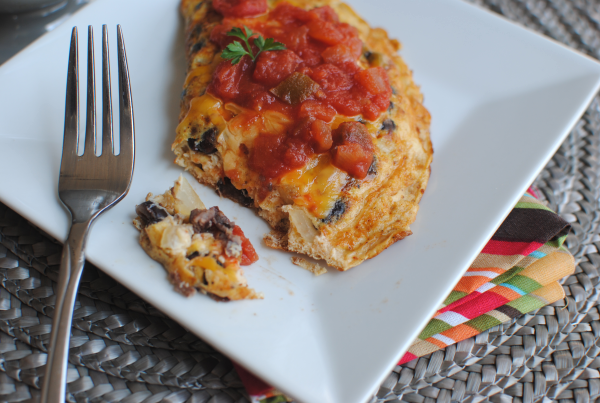 This Southwestern Black Bean Omelet is filling and tasty, but also low in calories. I figured it up and there are just 160 calories in this entire omelet! That even includes the cheese, which is where almost half of the calories come from. You could easily knock off even more calories by using reduced-fat cheese. My favorite thing about this omelet is that it’s super fast to make. It takes no time at all to whip up but leaves you feeling satisfied. With the protein from the egg beaters and the fiber and antioxidants from the black beans, it’s also very healthy. I find myself eating this for lunch more than I do for breakfast! If you’re looking to change up your everyday lunch or breakfast, you might try this out. 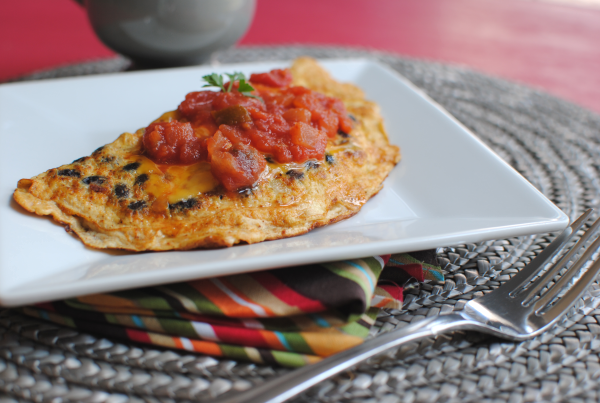 This black bean omelet is not only filling and tasty, but it’s healthy too! Heat a skillet over medium-low heat. Combine the egg, onion, black beans, salt & pepper, and chili powder in a bowl. Spray skillet with cooking spray then pour in the egg mixture. Immediately sprinkle with 1 tbsp shredded cheese. Let cook for 4-5 minute until the edges start to firm. Flip and the omelet in half and top other tbsp of cheese. Cook for about another 2 minutes until cheese is melted. Remove from skillet, top with salsa and serve! 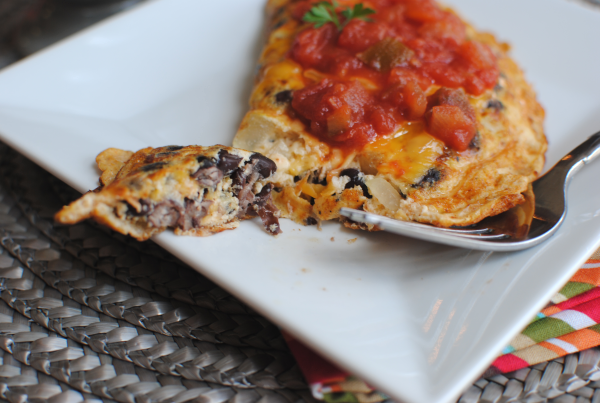 Save the rest of your canned black beans and leftover onion for another day to make another omelet! So yes, this isn’t a picture of candy bars. But you’ll be happy to know that it is a picture of something just as incredible. These biscuits were my very first biscuit success! 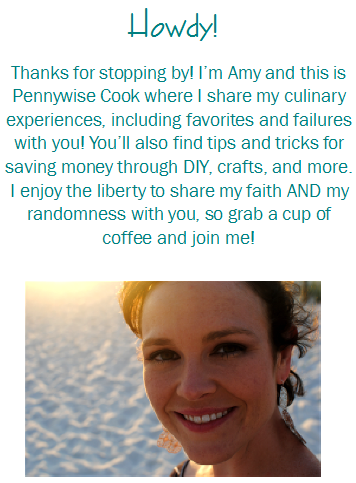 A friend of mine who blogs at Thrifty T’s Treasures recently shared a biscuit fail of her’s. 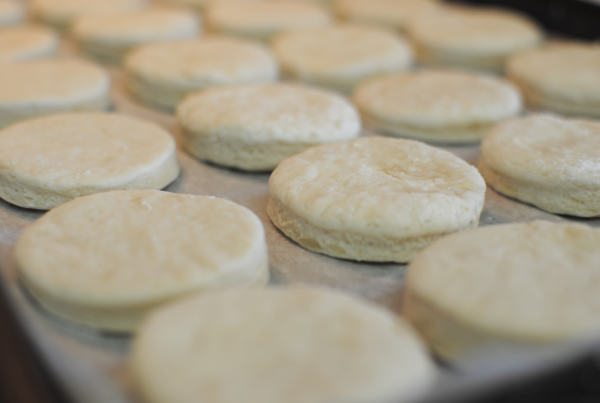 Let’s face it, it’s not easy making perfectly fluffy biscuits. But I also don’t want to spend my entire afternoon in the kitchen creating the perfect biscuit dough, either. This momma has plenty to keep her occupied without slaving over biscuits. So I was very excited to find this recipe over at Fun Cheap Free. And I figured they were worth sharing because A) I was able to snap pretty narly pictures of them and B) they were actually edible and C) Addie just loved them and she’s my biggest critic. The ease of this recipe is what makes it so good. That and the fact that it only contains 3 easy ingredients. 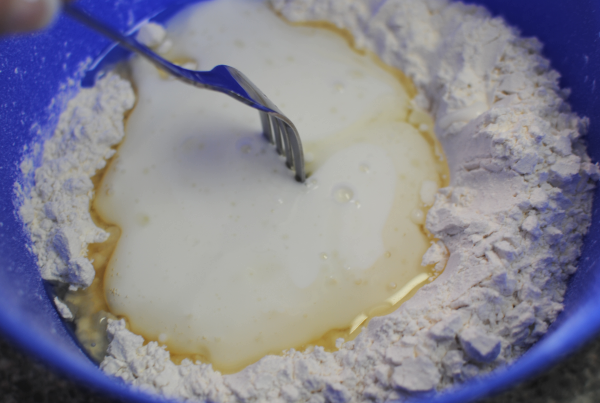 Start with 3 cups of self-rising flour. The self-rising part is very important so don’t use any other kind. Make a well in the middle with your wooden spoon and pour in 1/4 cup vegetable oil. Or canola oil, or whatever kind oil you have. Next, slowly add in 1 & 1/4 cup buttermilk and then using a fork stir to combine. Don’t worry about it being all lumpy. Lose the fork and then use the two best cooking utensils that God gave you, your hands. 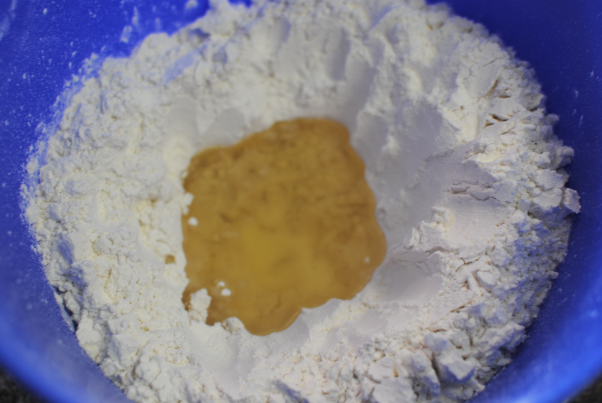 Knead the dough until well combined and then turn out onto a floured surface. Roll it out, but not too thin. You want them pretty thick in order for them to rise a bit and have some fluff to them. 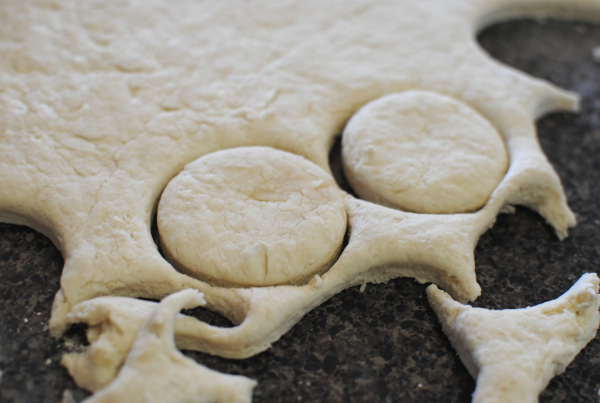 Using a biscuit or cookie cutter, cut out circles and place them on your baking sheet. Place them on the stove while you let your oven preheat to 400 degrees. This gives them some time to rise a bit. But just being honest, mine rose very little and they still turned out fine. I also put a little square of butter on each of mine before I placed then in the oven. And then when I got them out of the oven I sprayed them with I Can’t Believe It’s Not Butter. Neither of those are required, but make them extra good. 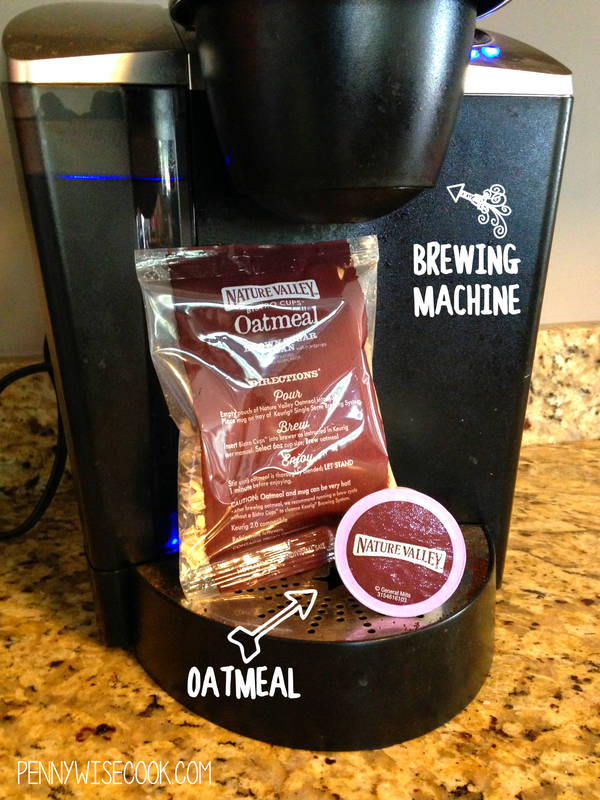 All you need is a good old cup of coffee and some jam to go with your biscuit and you’re set. 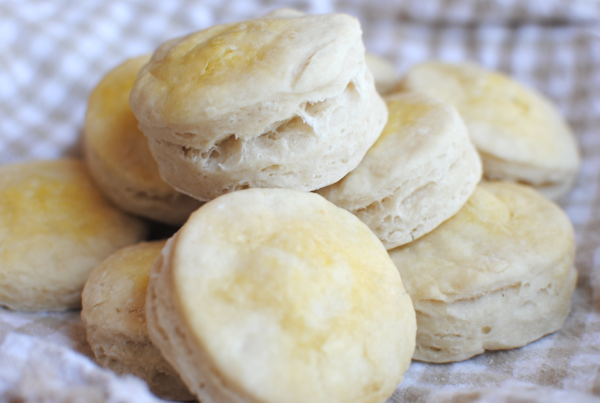 These seriously were the easiest biscuits I’ve ever made. 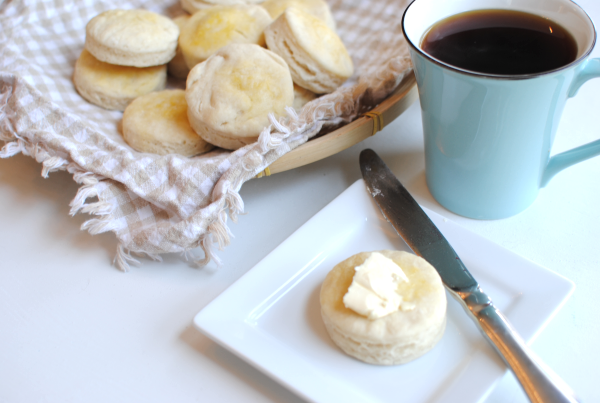 While they are buttermilk biscuits and don’t have that buttery taste like some biscuits, you can add whatever you like to them to make them yummy. I think they would make great biscuits for making and freezing sausage biscuits! Place 3 c. flour in a large bowl. Using your hand or a wooden spoon, make a well in the middle. Pour oil into well. Slowly add the buttermilk and use a fork to combine. Don’t worry if it’s lumpy. Use your hand to knead it into a dough ball. Turn out onto a lightly floured surface. Roll it out leaving it fairly thick. Use a cookie or biscuit cutter to cut out circles and then place them on a baking sheet. Place on stove to rise while you wait for your oven to preheat to 400 degrees. Once preheated, (optional- place a tiny square of butter on top of each), bake for 10 minutes or until starting to get golden. Her recipe said these only make about 6 or 7 biscuits, but I was able to get about 24 of them out of it. Mine were a lot smaller than hers, I’m sure. But they were plenty big for us. We’ve made it to Friday my friends! I start looking forward to Friday beginning on Monday, don’t you? I love Saturdays especially because there’s no rush to wake up and you can eat breakfast whenever you prefer. It’s always a good day of the week for a big breakfast since you can usually sit down as a family unit to eat without rushing off to work or school. But who in the heck wants to slave over the skillet, or oven, or even microwave on a Saturday morning? Well that last one isn’t that difficult, but I must admit that I find it a little laborious sometimes. 😉 That’s when a slow cooker comes in handy. Making something up ahead of time to enjoy later is a win-win situation no matter how you look at it. But for breakfast you say? Yep. Even breakfast. Your Christmas morning may never be the same again. 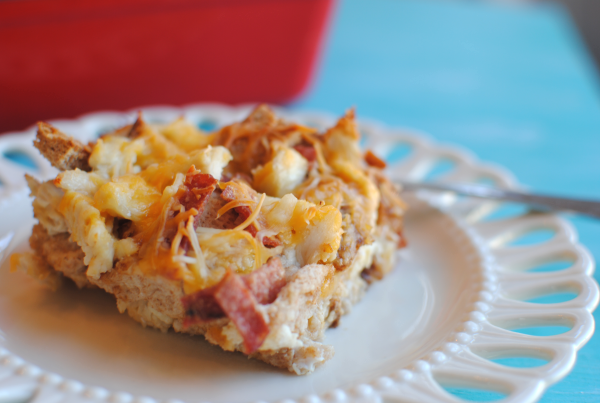 This is my version of a simple Slow Cooker Breakfast Casserole. This is made with things that I had on-hand. Very cheap to make and best of all, simple. My favorite part? It makes a TON! I’m able to make more than just 1 breakfast out of this which saves time and hassle for a few days to come. I love Save-A-Lot’s 10 for $10 sales. You can’t go wrong with turkey bacon for a $1.You could also buy precooked bacon to make life easier if you’re willing to shell out the extra dough. Otherwise, it’s just a matter of cooking up the bacon before adding it to the crockpot. Enjoy your weekend! I’ve got a special giveaway coming next week. I can’t wait to share! Breakfast doesn’t get any easier than creating it the night before and have it wait for YOU in the morning! In a skillet, cook onions, bacon, and sausage until no longer pink. 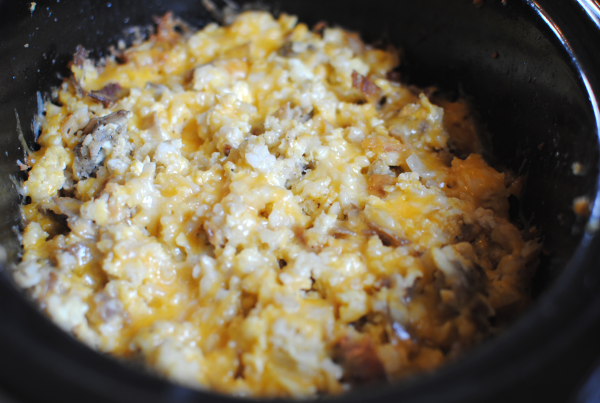 In slow cooker, place the hashbrowns and top with meat mixture. In a large bowl, scramble eggs and add the chicken broth and s&p. Pour over hashbrowns and meat mixture in slow cooker. Put lid on and cook on low for 4-6 hours. You can choose to stir it halfway through the cooking time if you prefer or leave it be. I did stir mine, but I think I’ll leave it next time. minutes or so until you plan to serve, sprinkle the shredded cheese over and replace the lid to let it melt. 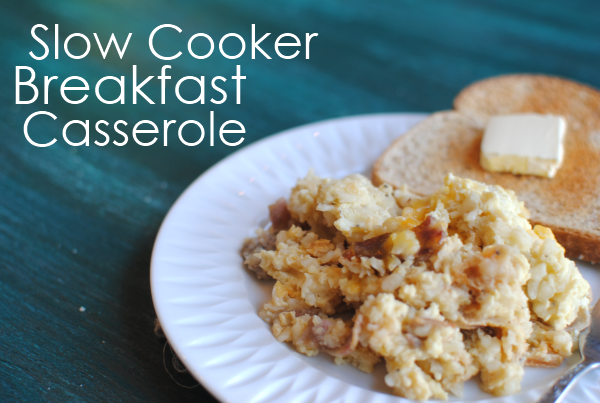 If you’re making this overnight, you might even use the “warm” setting on your slow cooker to avoid overcooking. I made this during the day (to have breakfast for dinner) and did not cook my meats through before hand. Mine cooked for 8 hours and I stirred halfway through. I’ve always been a fan of blueberry muffins. You’d never know it. I can probably count on 1 hand the times that I’ve ever made them from scratch. The box mixes just make life so much easier don’t they? Sure, but do they give as much satisfaction as saying that you “made them from scratch”? Sometimes it really just doesn’t matter though. You’re tired, the kids are hungry, you just want a muffin! A very sweet friend of mine mentioned how much she loved Perkin’s muffins the other day. There’s one in my hometown where we visit often, but there aren’t any around here. Apparently their Mammoth Blueberry Muffins are to die for. My sweet friend seemed like she needed a little pick me up, so I decided to check around for a copy cat recipe of their famous muffins and whip some up. To my dismay, none of them really seemed to sound like they actually mimicked Perkin’s muffins. I decided to shy away from getting them just like Perkin’s and come up with my own kinda muffins. These turned out so absolutely fantastic! I really love when that happens. The stress of trial and error is surpassed with success. And boy were these a success. The breading part of these muffins is almost cakey thanks to a secret ingredient (which is not so secret anymore), sour cream. Not exactly something you’d expect to pair with blueberries, but tasty all the same. They boast a gooey blueberry jam filling and that’s in addition to the blueberries themselves, dispersed among the batter. What could top these better than a coating of sugar that has baked into a crust on top of the blueberry goodness? A smear of butter while they are still warm, maybe. Oh and I forgot to mention that these are in fact, mammoth. The batter only made 6 of a huge pan of muffins. So you’ll either have to make a second batch or prepare to share. 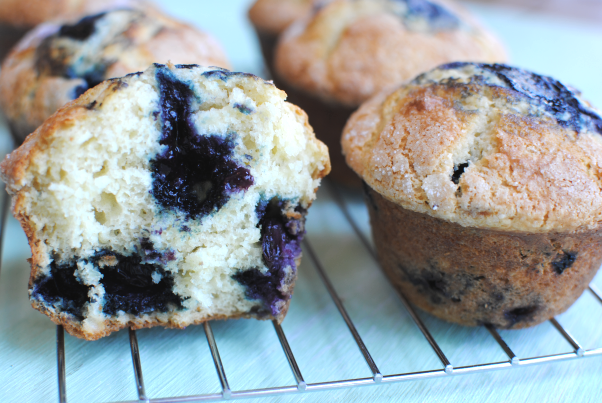 Combine all muffin ingredients except blueberries in a bowl and mix well. Stir in1 c. blueberries. Meanwhile, microwave 1/4 c. blueberries with cornsstarch and sugar for 20 seconds at 50% power. Remove, much and stir and then continue microwaving for increments of 20 seconds until thicken and jam-like. Pour muffin batter in large, 6-ct muffin pan and create small wells in each. 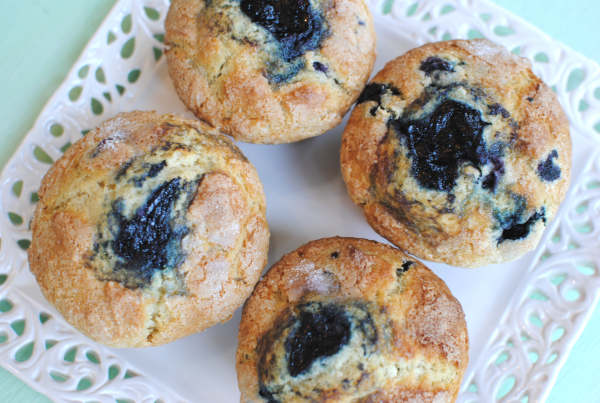 Using a piping bag or ziploc bag, fill each muffin’s well with filling. Sprinkle each with 1/4 tsp sugar. Bake for 22 minutes or until tops are golden brown. Note- if you use smaller muffin tins, you may need to adjust your cooking times down. Y’all know I’m a big fan of my sweets. Did you see yesterday’s recipe? I especially love recipes that don’t include many ingredients. In most cases that means that it will cost less to make and it will take less time. Cheaper and I can eat it sooner? My kinda recipe. I can’t take credit for these sweeties today. I found this one inside the Fite for Your Life II cookbook by Janis Forbes Fite, RN. It’s a really good cookbook for low-fat and simple recipes. And she’s from my home town! 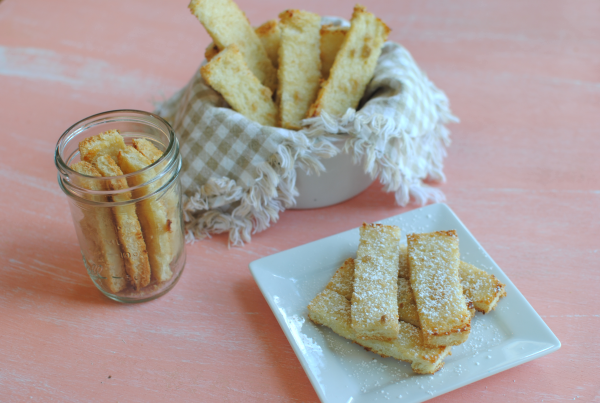 These are SO simple and perfect for a brunch, baby shower, or tea. Very light and airy and made out of things you probably have on-hand. It starts with day old white bread. Now I’m not going to lie. My bread wasn’t old. In fact, I bought it the day that I made these. So I just popped them into the toaster for a taddy bit to get them a little “stale”. Worked like a charm, but had me considering the need for a 4-piece toaster. It took a while to toast up all that bread. Pop them into the food processor to make your own bread crumbs. Dip them in melted butter and sprinkle with cinnamon and brown sugar, then bake at 350 degrees for 20 minutes or so. Tasty sweet treat! Use them to make bread pudding. Freeze for later to make any of the above! Enter, sweetened condensed milk. The fat-free kind that is. 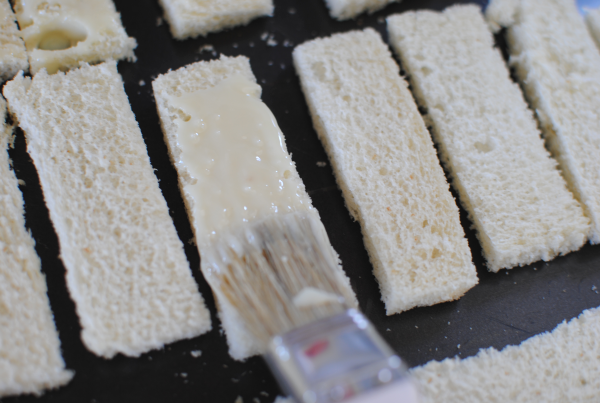 Using a pastry brush or whatever kinda brush you’d like, spread a generous amount onto each piece. This is what gives it that yummy sweetness. Oh yeah. Pop those loves into the oven and let them get all brown and crusty. And if you’re like me, you’ll sprinkle on a little powdered sugar just because. They are so good! 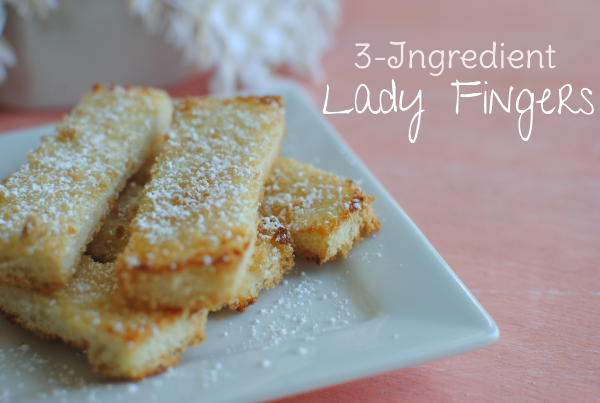 Maybe not exactly like other Lady Fingers that you’ve had. But hey, with plain old (literally) white bread and a couple other simple ingredients, you just can’t beat it. 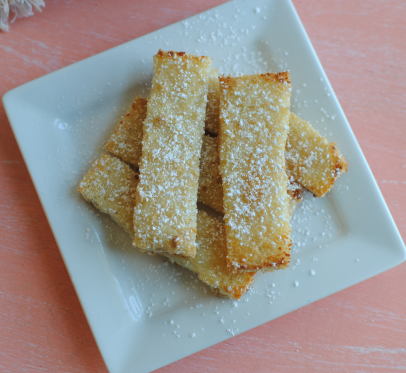 Using day old white bread, sweetened condensed milk, and brown sugar you can create Lady Fingers in no time flat. Preheat oven to 350 degrees. 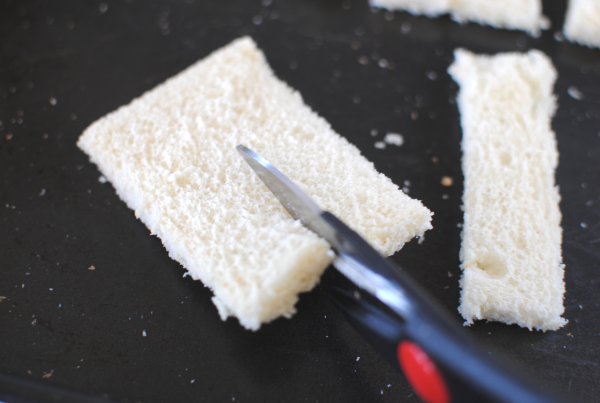 Trim the crust off bread. Cut each piece into 3 fingers. Brush each generously with sweetened condensed milk. Sprinkle each with brown sugar. Bake for 10 minutes or so until golden and bubbly. The reason there are no specifics amounts listed on this recipe is because it is completely up to you how many you make. I didn’t use an entire loaf of bread or an entire can of sweetened condensed milk. 1 can will go a very long way. You can probably make 50- 100 with 1 can. Store in an air-tight container or bag. I told you yesterday about my surprise party and sudden house guests. I was so excited to have them since I don’t get to see my sister, niece, and nephew very often. It’s always so fun when cousins get together. They got to have a sleep over and to our surprise, they actually went to bed before midnight. In the morning, I wanted to make up some breakfast for everyone but I wasn’t sure if cocoa pebbles would fit the bill. So I scoured my refrigerated and found some biscuits that I had gotten for cheap when they were on sale. You know those Pillsbury ones go on sale for $1 all the time and you can get them even cheaper with coupons. I assessed my bacon and egg situation and alas, there just wasn’t enough to make a real breakfast. I checked out Google and adapted this recipe from Healthy and Homemade’s idea for cinnamon rolls made out of regular biscuits. I had all of the ingredients and didn’t have to make up any special dough which really cut down on the time. They were so easy and the perfect breakfast in a pinch. We don’t eat cinnamon rolls too often around here so we don’t usually have them in the refrigerator. 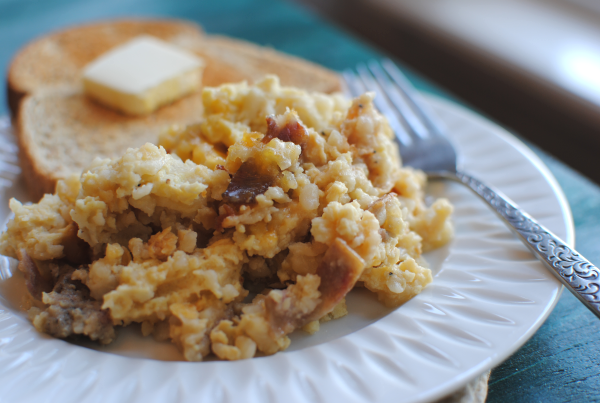 But for times like this when you need a last minute breakfast, this recipe is perfect. 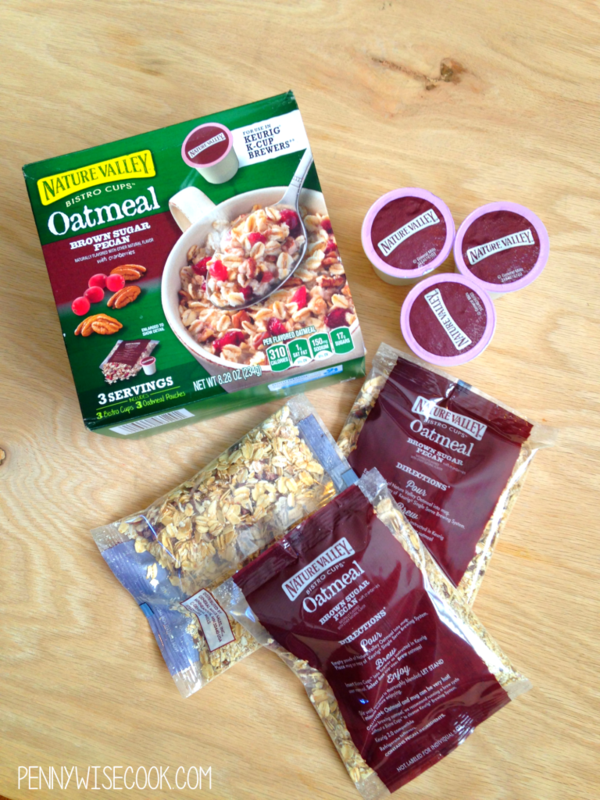 Need a fancy breakfast in a pinch? 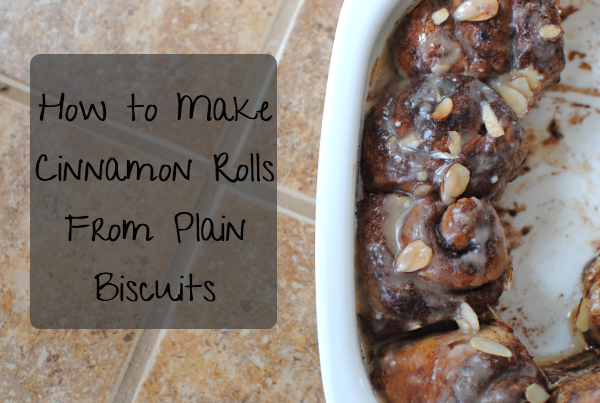 Whip out the biscuits and make your own cinnamon rolls! Preheat oven to 350 degrees. Mix together the cinnamon and sugar and place on a plate. Open dough and roll out each biscuit into a long cylinder. Dip into butter and then into cinnamon sugar. Gently roll into a pinwheel and place in a greased baking dish. Follow the same steps until you have finished with all biscuits. If you have leftover butter and sugar, mix together and pour over the top of the cinnamon rolls. 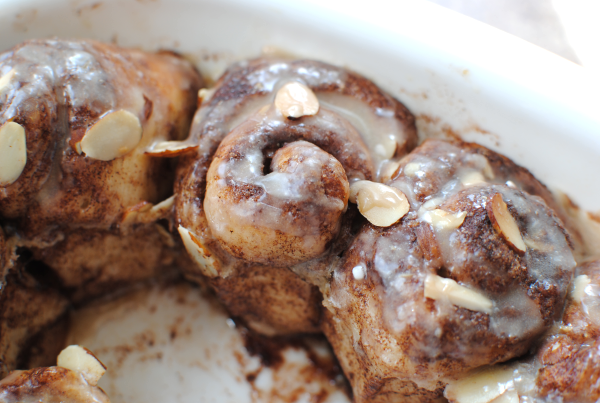 Meanwhile combine glaze ingredients in a small bowl and brush over cinnamon rolls when they are done. You may be wondering about that little bit of peanut butter that made it’s way into the glaze ingredients. I added this for depth of flavor and it was very subtle but yummy. My husband didn’t even notice it until I pointed it out, but he really liked it. Over the weekend, my husband threw me a surprise birthday party. My birthday was Wednesday so I wasn’t expecting anything, but I knew that something was going on. He made up a very silly story to cover up why he didn’t get me mug hooks one day when he went out to “get some fresh air”. He came back and I asked for my mug hooks and he said that Lowes had a hook shortage. LOL Of all places on earth to have a hook shortage. He surprised me with a big party, my sister and the kiddos came all the way from 2 hours away, and this fabulous cake. One meal idea that I always know will be a winner on basically any night of the week is breakfast. I love to cook breakfast for dinner because I know that there will be absolutely no opposition to eggs, bacon, biscuits, cheese, and all of that yummy stuff. It’s so effortless to whip up and makes the house smell incredible. 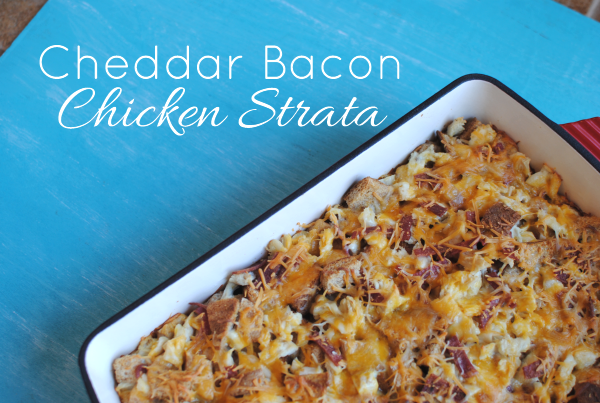 I found this recipe over at Spark People and decided to add a little bacon to it. Because if you ask me, that was the only thing missing from it. I used turkey bacon as to not add too much more fat. It’s got about 207 calories per serving without the bacon and since I didn’t use that much bacon so I don’t think that it tainted the calories that much. Believe me, you cannot tell that this dish is lower calorie. I mean just look at that. Having chicken in it makes more filling so you won’t have to feel as if you’re not providing enough substance if you make it for dinner. My favorite part? It’s kinda like a crockpot meal. You put it all together in the morning (or the night before for breakfast or brunch) and let it set and get it’s yumminess on all day. Then when you’re ready to eat, pop it in the oven and bake it to perfection. Simple as pie! And like I said, it makes my life easier when I know that everyone in my family will like it! 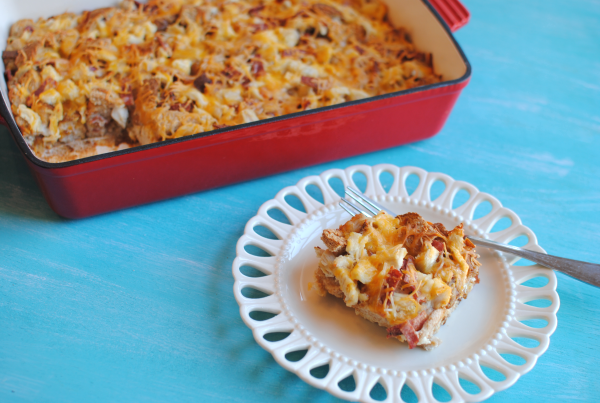 Perfect for brunch (or dinner), this easy strata is a great make ahead meal that will please even the pickiest eaters. 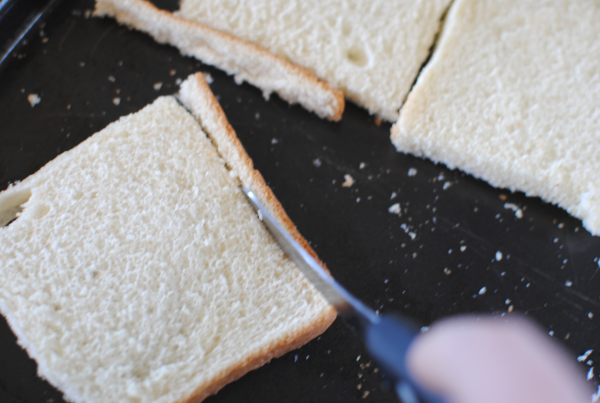 Place half of bread cubes into bottom of a 9×13 greased dish. Add 1/2 of cubed chicken and half of turkey bacon. Top this layer with 1 cup of shredded cheese. Add other half of bread crumbs, chicken, and bacon. 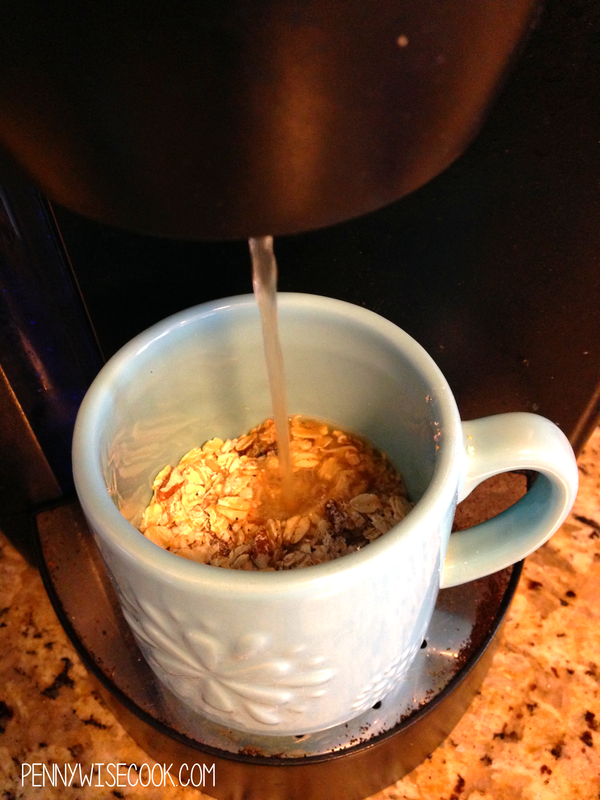 Beat eggs with the milk and evenly pour over to moisten. Top with remaining 1/2 cup cheese. Cover and refrigerate for at least 2 hours to overnight. Preheat oven to 325 degrees. Bake for 45 minutes or until a knife inserted comes out clean.